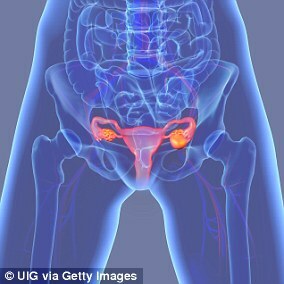 Millions of women wrongly believe smear tests can detect ovarian cancer, experts have warned. Health charities believe this fundamental misunderstanding is putting women’s lives at risk. They warn that many women ignore symptoms until it is too late – mistakenly believing that the screening programme for cervical cancer will pick up all gynaelogical cancers. This confusion means many women assume they ‘protected’ against ovarian cancer and write off symptoms when they experience them. Polling by the Target Ovarian Cancer charity reveals 22 per cent of women – 5million across the UK – think smear tests will pick up ovarian cancer. Regular smear tests are offered to all women between the ages of 25 and 64 to detect the early signs of cervical cancer. But they do not pick up any other cancers. There is no screening programme for ovarian cancer, because no reliable test exists. Women are being put off cervical screening over fears the results could suggest they or their partners have been cheating, a survey found earlier this month. Experts from charity Jo’s Cervical Cancer Trust have warned that a sense of ‘shame’ from being diagnosed with human papilloma virus (HPV) – the virus responsible for most cervical cancer cases – is adding to the anxiety of smear tests. They said the infection, which affects eight out of ten women at some point in their lives, must be ‘normalised’ to encourage more women to attend life-saving screening. The survey of more than 2,000 women found nearly 40 per cent said they would be worried about what people thought of them if told they had HPV and slightly more said they would worry their partner had been unfaithful. Yet the disease, which is known as the ‘silent killer’, has few obvious symptoms, so it is often diagnosed at a very late stage. Roughly 60 per cent of cases are diagnosed when the cancer has already spread around the body – making it very difficult to treat. Some 7,270 women are diagnosed with ovarian cancer each year – and 4,230 die each year as a result. A major problem is that the symptoms are often mistaken for mild complaints. The warning signs include bloating, feeling full, tummy pain and frequently needing to go to the toilet – all issues that could be down to irritable bowel syndrome or other common conditions. Annwen Jones, chief executive of Target Ovarian Cancer, said: ‘We need to combat the confusion around ovarian cancer and cervical screening, because while smear tests are a vital tool in public health, a similar option simply does not exist in ovarian cancer. ‘While we welcome government investment in raising awareness of the cervical screening programme, the ovarian cancer community is painfully aware that 11 women die every day from ovarian cancer and we urgently need to see a national ovarian cancer symptoms awareness campaign.